Spice Temple | 15,000kms of Food! I was totally pumped to be trying yum cha at Spice Temple. And because of this high expectation, it didn’t quite hit the mark. 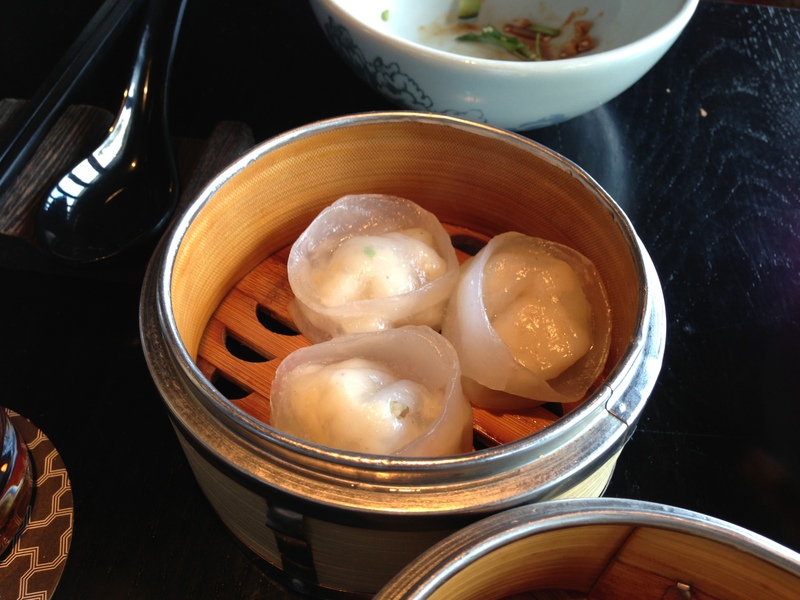 The food was great, but it’s like something is missing from the normal yum cha experience. Maybe it’s the trolleys of food, maybe the packed bustling restaurant or maybe just plain old rude waiters that were missing. Anyway, let’s look at the food. 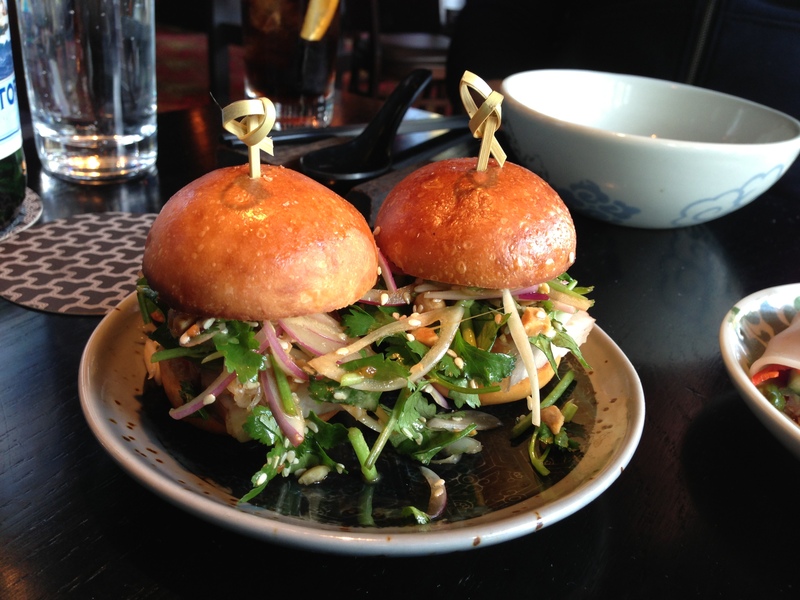 Started with “crispy Guangxi pork sliders” which were very good. Not very yum cha like, but hey, it was delicious. 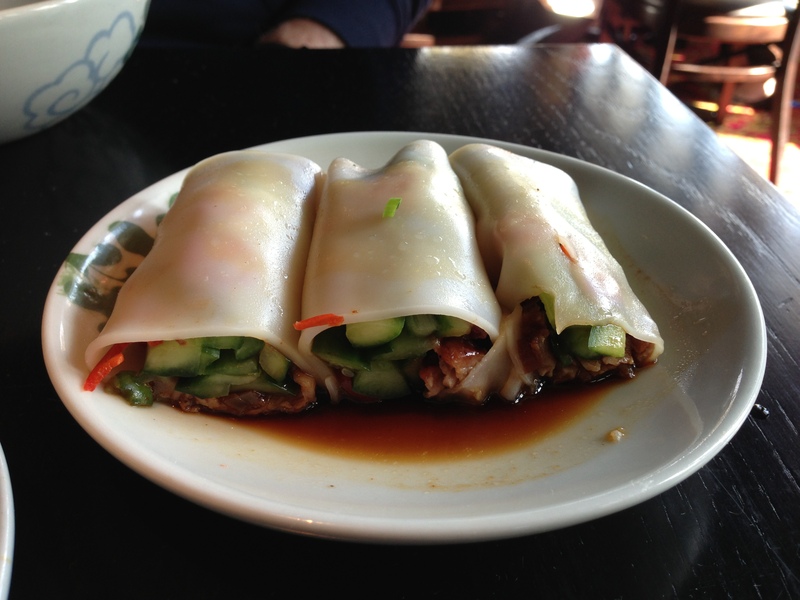 The next dish was really disappointing for me: “steamed rice noodle roll with char sui pork“. I was expecting a fine delicate silky noodle but this was a thick blanket engulfing the pork. 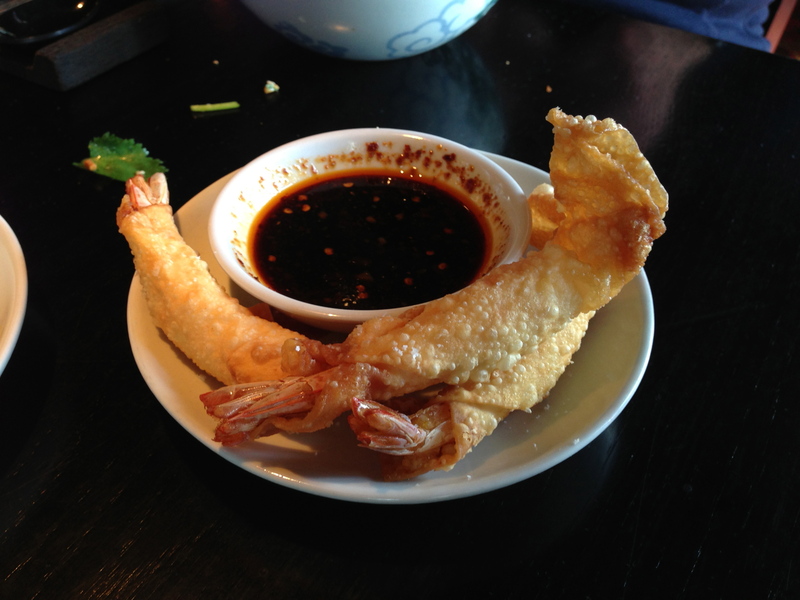 You can never fail with a serve of “crispy prawn wontons with hot and numbing sauce“. As described, it was crispy and the sauce was tongue numbing. Delicious. The old favourites get a high class makeover. 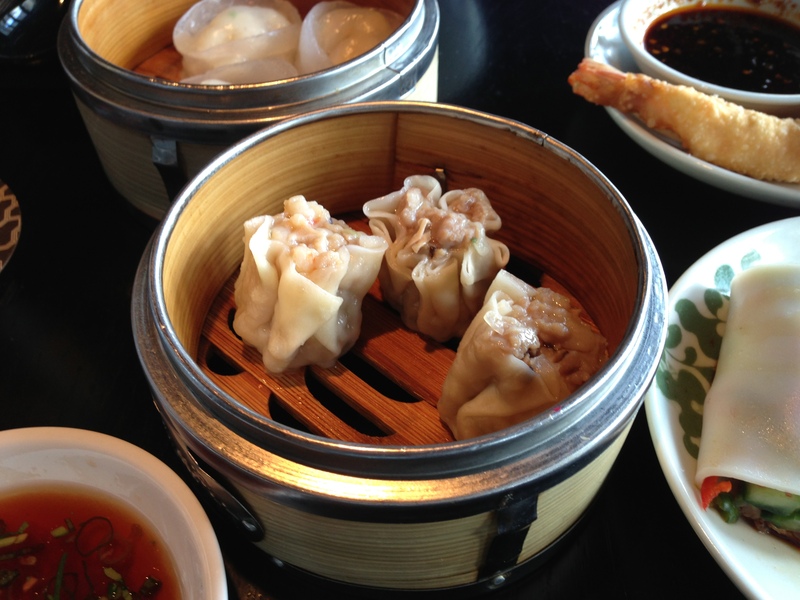 “pork and prawn siu mai” and “steamed scallop dumplings” are good. The “King Prawn wontons with aged black vinegar dressing” wontons were beautiful: silky with a nice bite to the prawns. The sauce was a bit overwhelming, so try to avoid taking a mouthful of it. 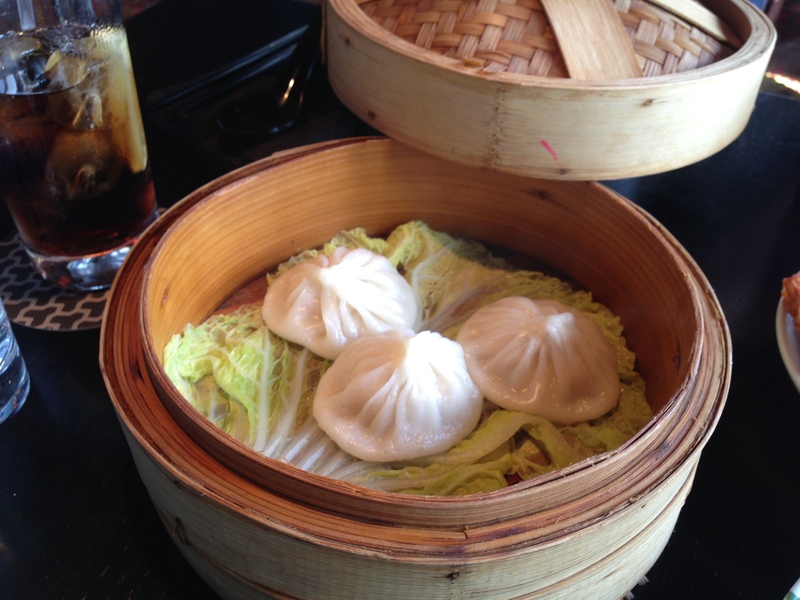 Last up was the old favourite: “chicken and crab xiao long bao“. They were excellent. So, a few hits and misses. I think it’s a once in a lifetime thing and you just have to try it out. I love spicy Chinese food and Spice Temple delivers on many different levels of it. The restaurant decor is very modern has a certain sexiness to it, and the food is wonderfully exciting and made from great fresh ingredients. Was here as for a reunion dinner with 2 of my favorite ex-workmates and it was a blast – spicy food and lots of wine! 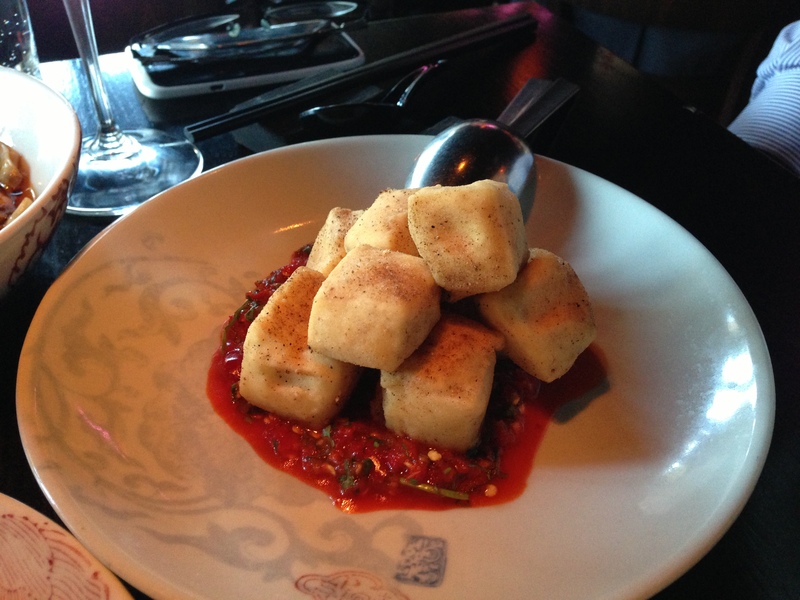 We started with “fried salt and pepper silken tofu with chilli“. 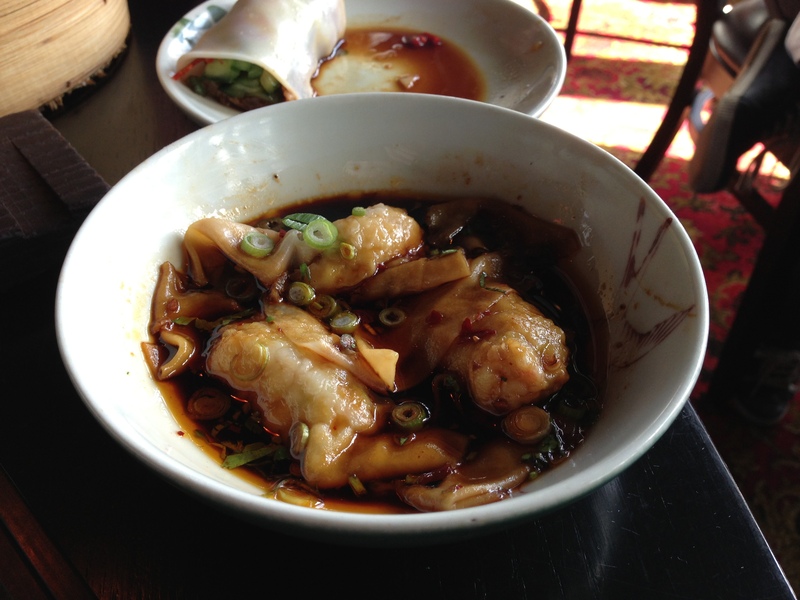 The tofu was delicately fried on the outside and silky on the inside, and served with a fresh chilli sauce. The “fish fragrant eggplant” was absolutely delicious. 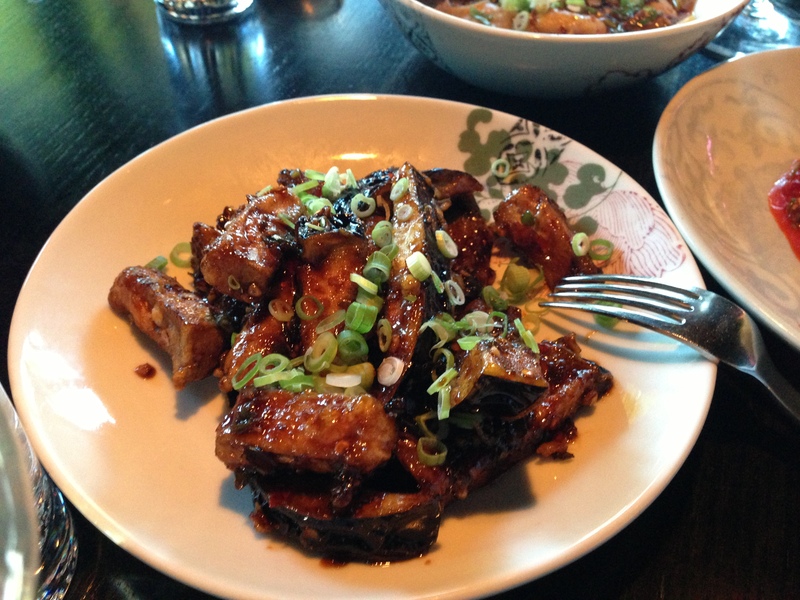 Eggplant that had been fried so it’s crispy and then coated with a powerful tangy spicy sauce. 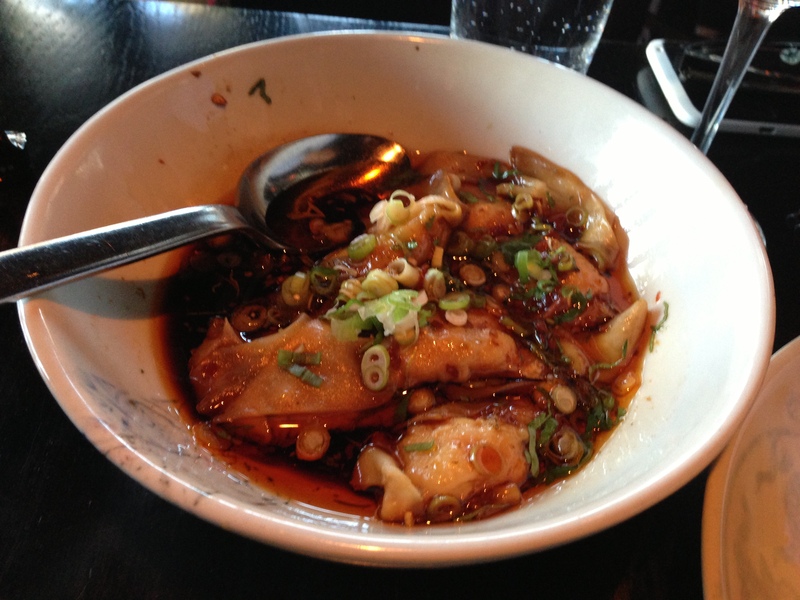 The “king prawn wontons with aged black vinegar dressing” had chunks of prawn meat in the wonton and the was swimming in spicy sauce. Loved it! 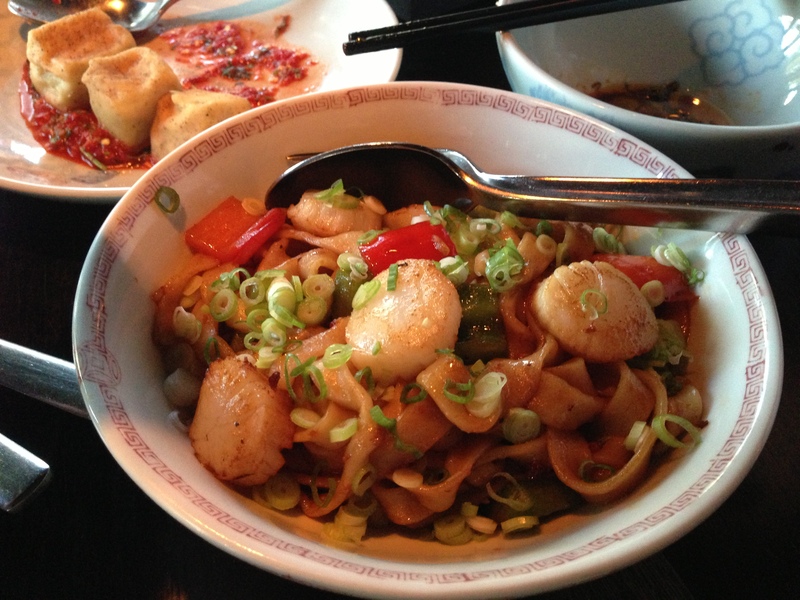 The “stir fried sea scallops with handmade egg noodles and chilli paste” was a lovely dish that had sweet scallops thrown into wonderfully thick and tasty noodles. 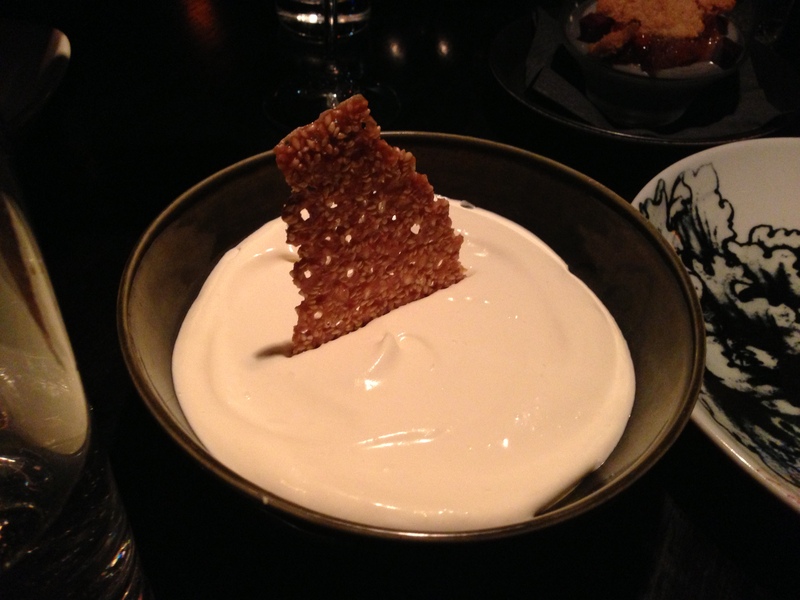 No surprises here – the dish taste exactly as the description. 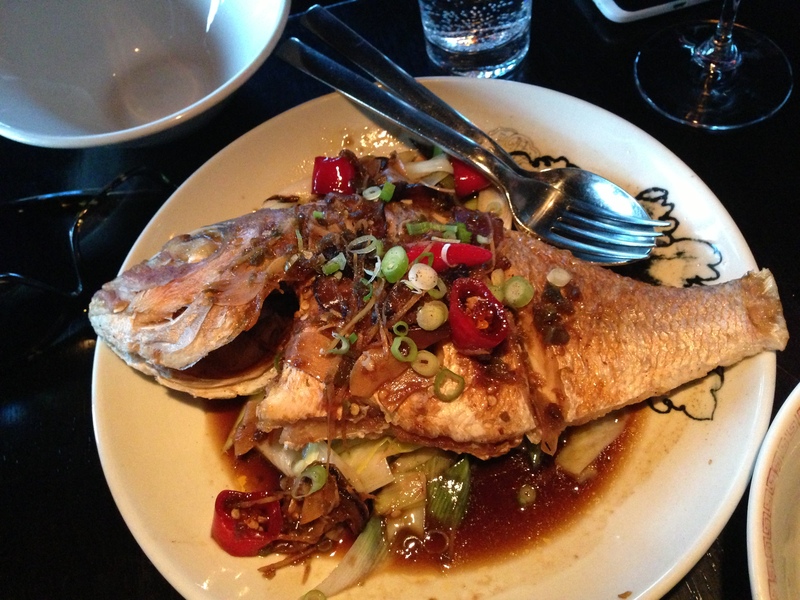 The “steamed snapper with salted chilli and black bean” was the dish that the waitress recommended to us and it was a good choice as the fish was fresh and tasted wonderful with the chilli and black bean. Given we were having such a great time and the food was superb, we decided to have dessert! 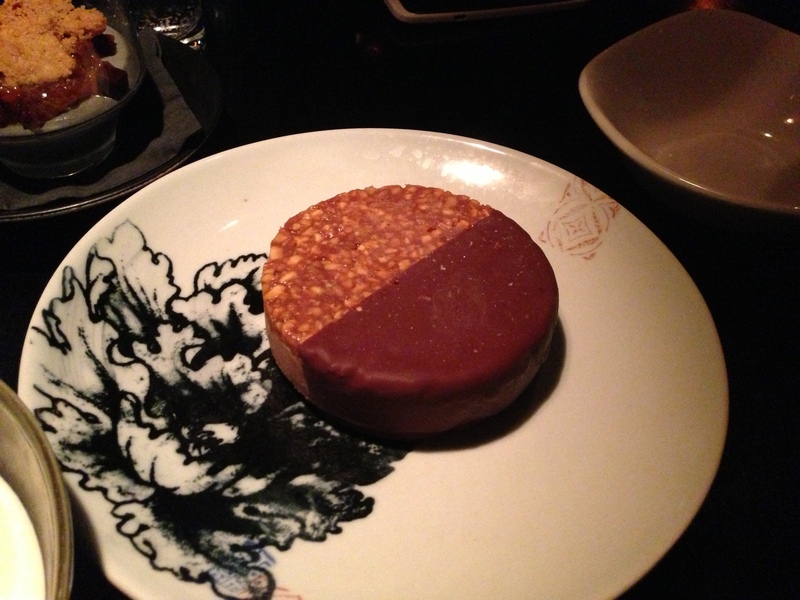 The “caramel chocolate and peanut parfait” was a rich and delicious. And I love a good mango pudding so the “mango pudding with condensed milk chantilly” had to be ordered! It was creamy and delicious. Upmarket Chinese food that delivers a punch – I think it’s a difficult feat to accomplish and Spice Temple does it wonderfully. The food does not hold back on flavour and chilli. Coupled with great atmosphere, location and service, it’s a winner for me. 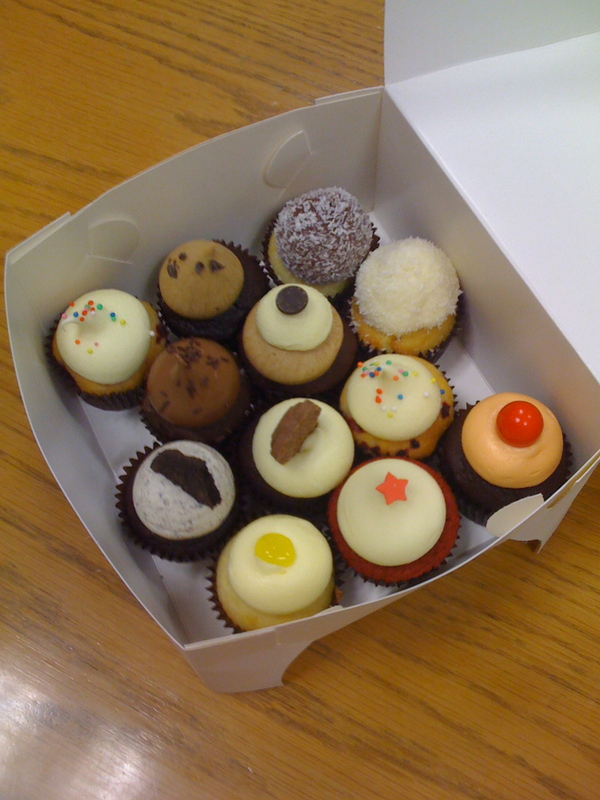 Thought I’d post up the collection of sweets & desserts I’ve accumulated over the course of the year… I’m not big on sweets and desserts, but when it looks so good, and taste yummy, I’m all in! So we’re starting with treats in the morning. 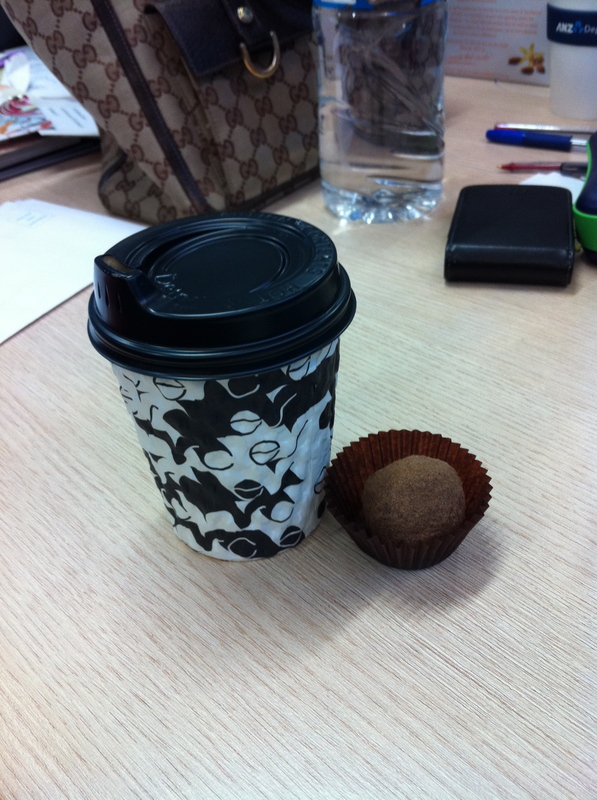 What could be more delightful then a good cup of coffee, with a truffle or macaroons to go along with it? 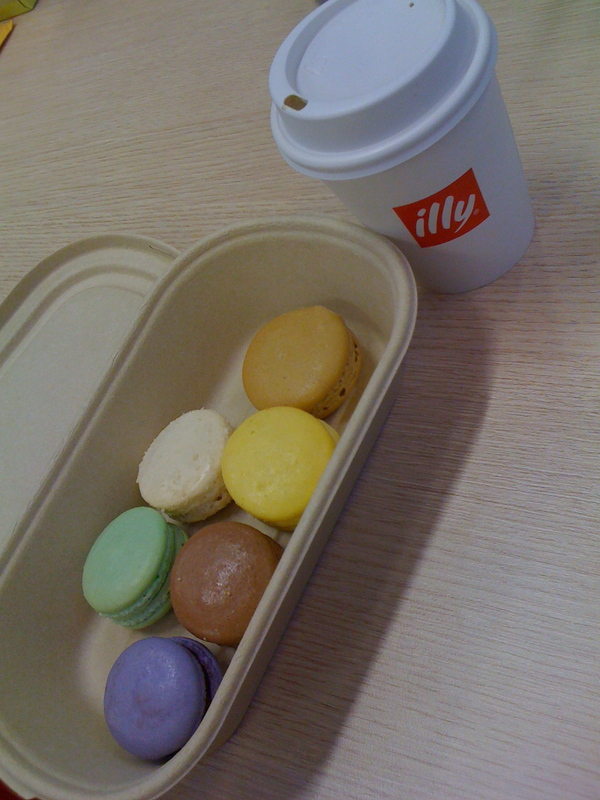 The coffee on the left is from Caffe Esc in Docklands, great coffee, great guys and on the right we have Cafe Vue (the old cup, not the new black and white fancy ones) along with the best macaroons in the city. 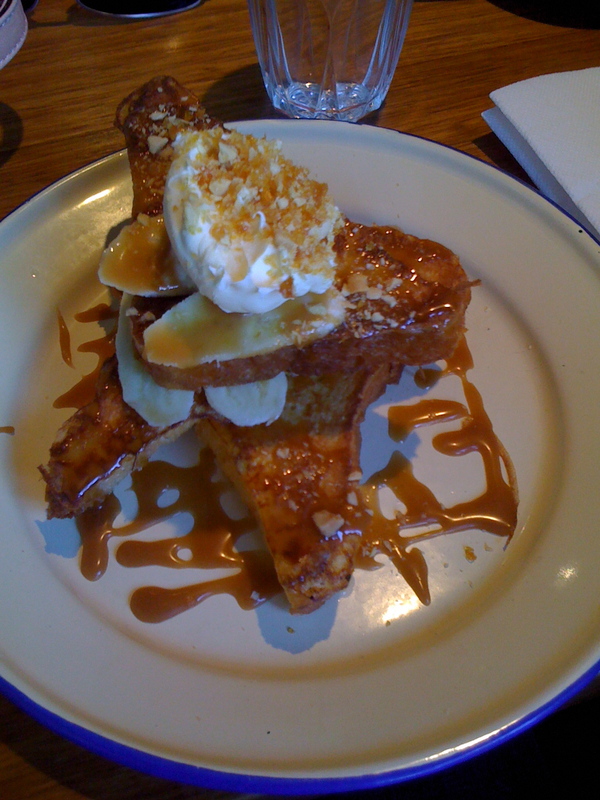 Morning tea delights of French toast with banana, cream and toffee sauce (Seven Seeds) or mini cupcakes in various flavours (Little Cupcakes). I love the variety on dessert platters! 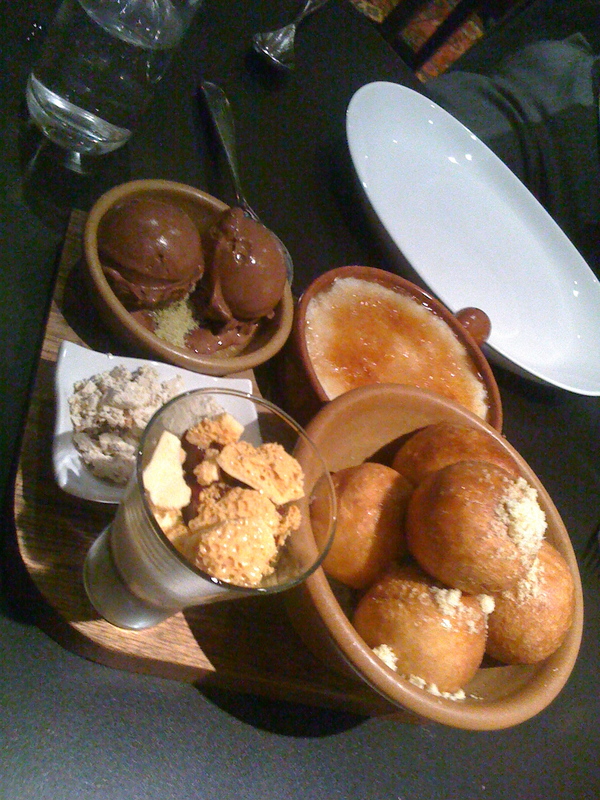 Maha‘s platter consisted of fluffy donuts, chocolate ice cream, panna cotta with honeycomb and a middle eastern inspired creme brule. This little fluff ball comes from Spice Temple. 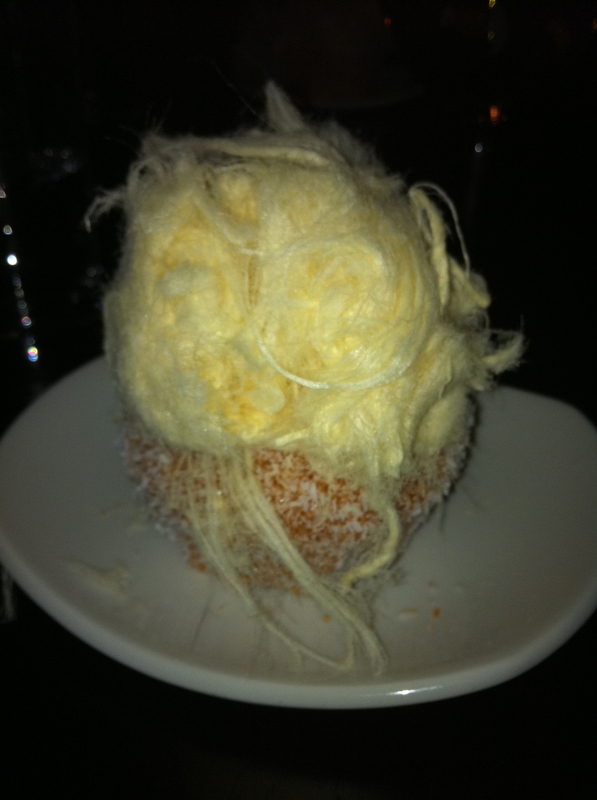 I don’t remember the exact description but I’d describe it as a kumquat filled cupcake topped with citrus turkish fairy floss! The humble pavlova is one of my favourite desserts, and this lovely, simple and light dessert is taken to a whole new level at the Palace Hotel. It’s absolutely gorgeous to look at, and delicious. 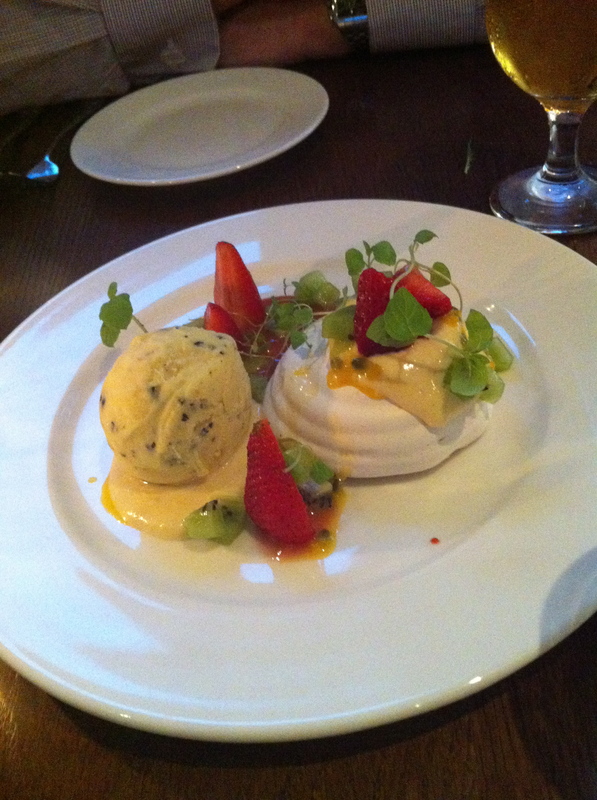 The Eton’s Mess is also another winner at the Palace, however, it’s not on the menu for this summer.